I must admit that for years I thought the red circle with a bike in the middle meant cycle path. So i always rode down alleys with them on! The thing I love about those signs is their utter lack of standardisation. 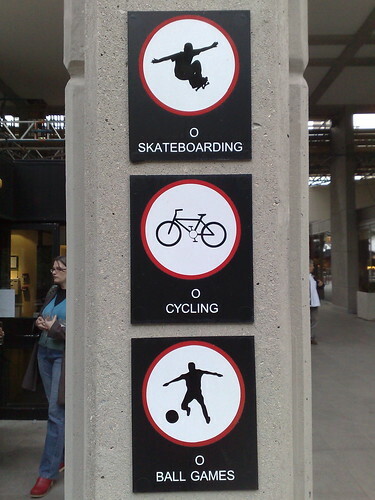 It seems that, a century after the invention of the safety bicycle, we now know how to represent it in an icon, so maybe in another forty or fifty years there’ll finally be a single skateboarding prohibition standard. An old deck makes a perfect TV dinner table when placed across the arms of a comfy armchair. Ideally the trucks and wheels should fit snugly up against the arms of the chair to avoid slippage due to the involuntary muscle spasms that often plague men in the later stages of life. Another tip for the ageing skateboarder is to move on to longboarding, a field that provides an old man with an adequate dose of adrenalin without the need to master control of the legs as required by modern streetboarding. Feel free to add more tips to the article, as it is a wiki.